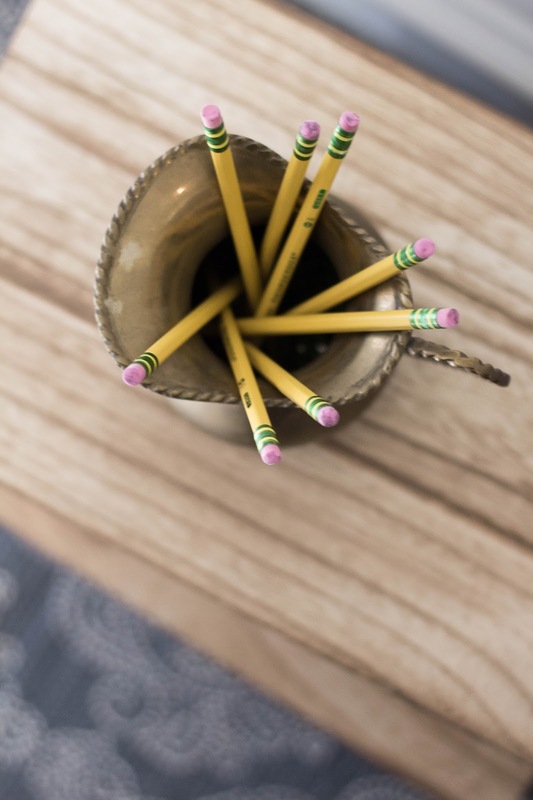 This month, I've been making little updates to the house on a budget, since the goal is to do a major renovation on our kitchen by the new year. 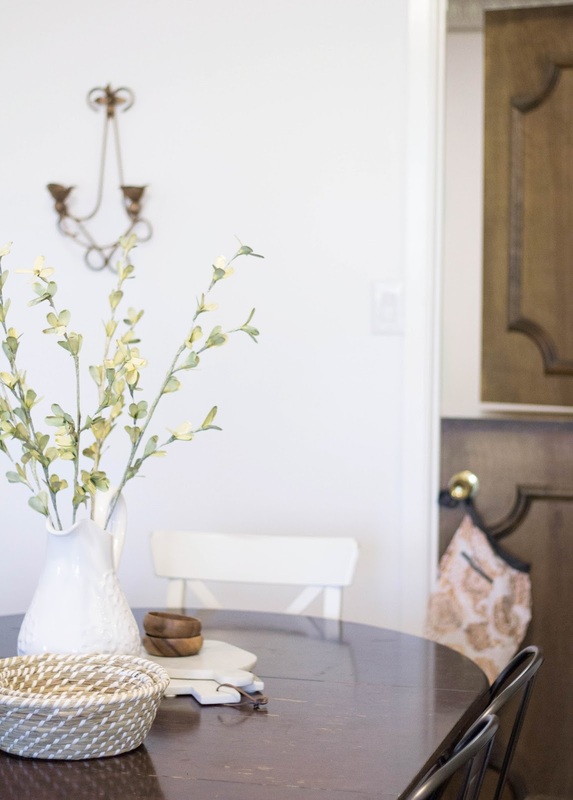 So far, we've added a fresh coat of crisp white paint in Chantilly Lace by Benjamin Moore to the dining and hallways, and painted a gorgeous soft grey on our living room walls in a color called Gray Owl. 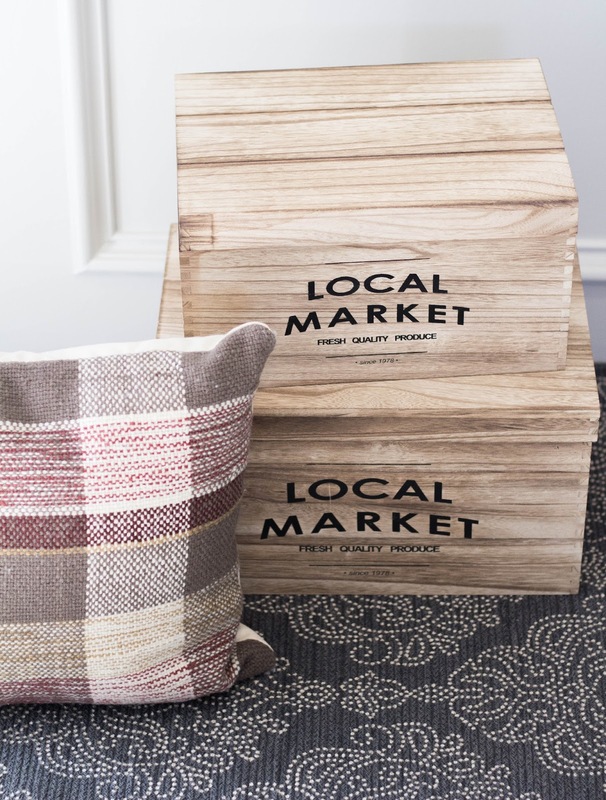 I've been trying to create a rustic and cozy feel throughout the house with the help of patterns, color, and textural elements like wicker and wood. In our dining space, I've been working on a gallery wall of cozy items to bring in the Fall vibes. I collected the wooden signs I had on hand from one of my favorite decor shops, Vine + Branches and I can't wait for them to be part of this special wall. 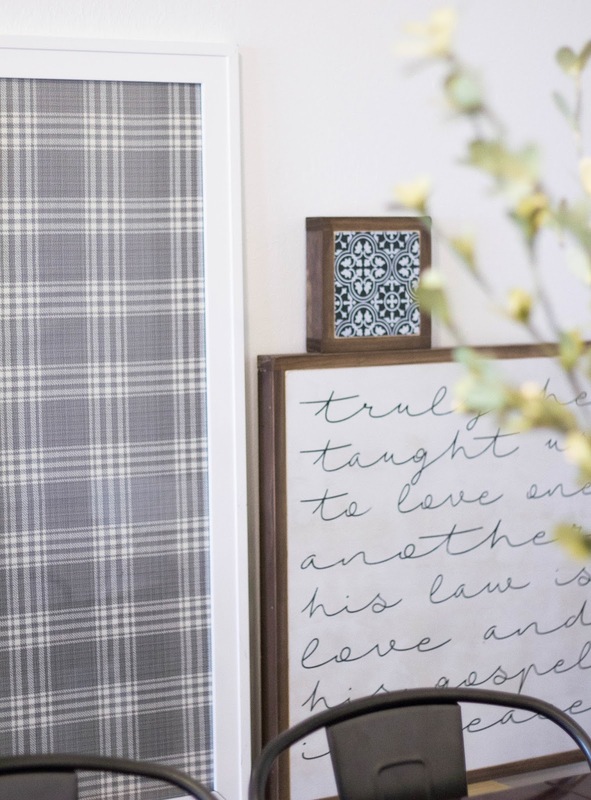 Since plaid has been a huge thing for me this season, I found a neutral plaid textile that I framed and I think it will bring the perfect amount of coziness to this gathering spot in the house. 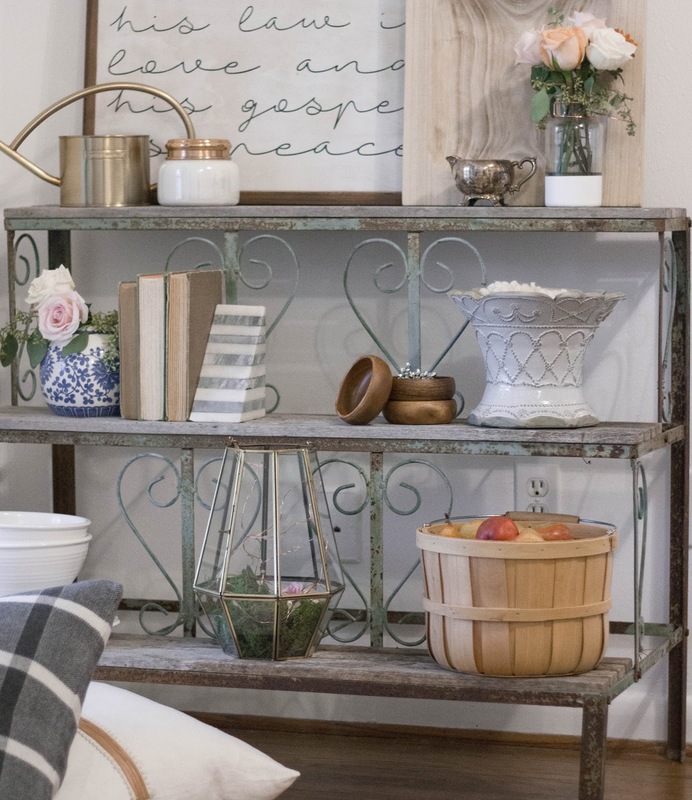 With a touch of vintage and a buffalo check pillow to tie in with the framed textile, this Fall home is starting to look collected and whole. 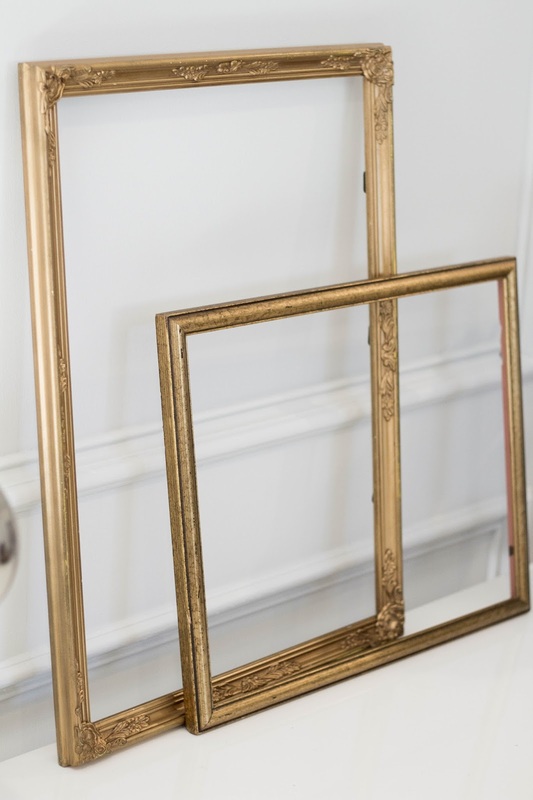 I hope to share the finished gallery wall with you very soon on the blog. 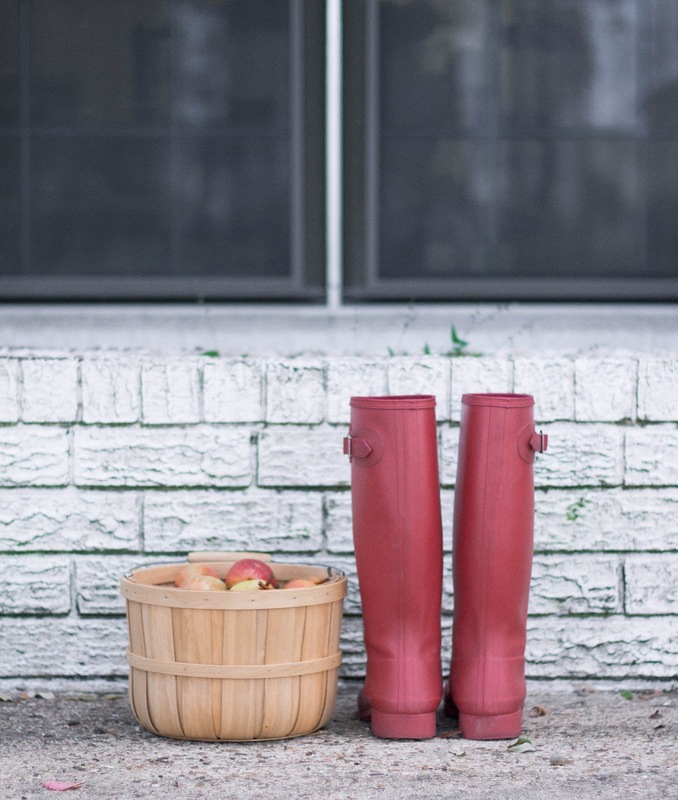 There are a few Fall wardrobe essentials I wanted to share with you, that have been getting good use this season. 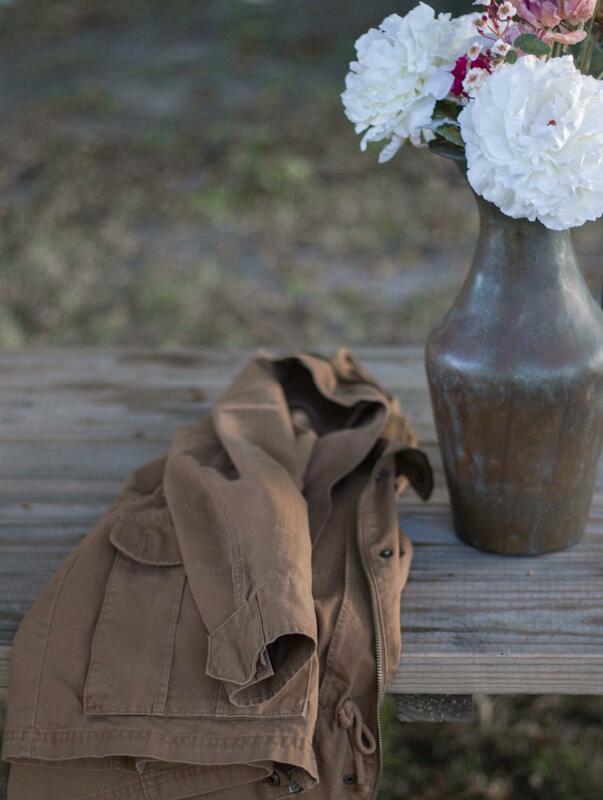 I think every gal should have a few rust toned items in her wardrobe. 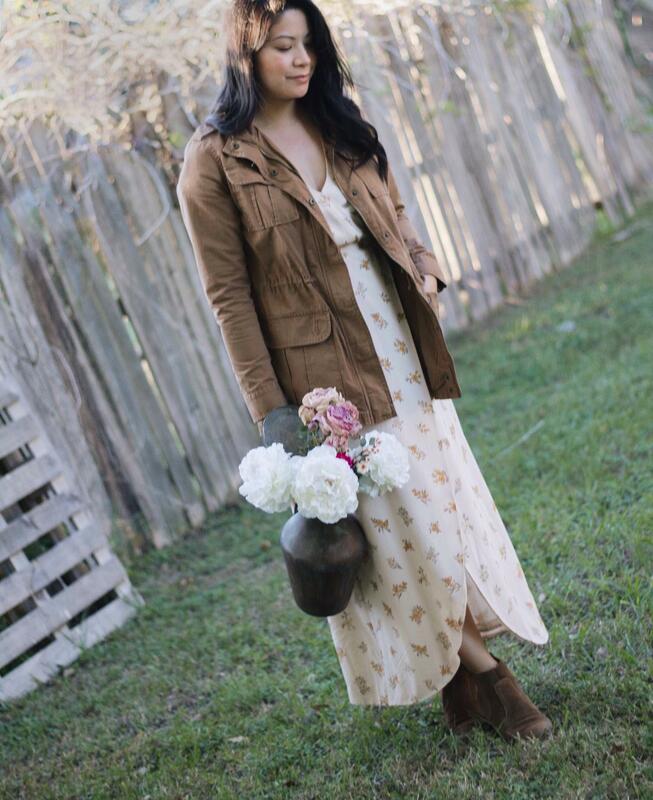 This parka jacket has gotten lots of love since I purchased it at Target last year. I loved it so much that I even purchased a second jacket in olive green. For these Autumn days, all you need is a light jacket (thank you Miss Congeniality) and it will surely compliment any Fall wardrobe, as it has so well with mine! Here is a similar jacket that I think you will love just much! Cost Plus World Market has been my go-to for the past year for earrings. 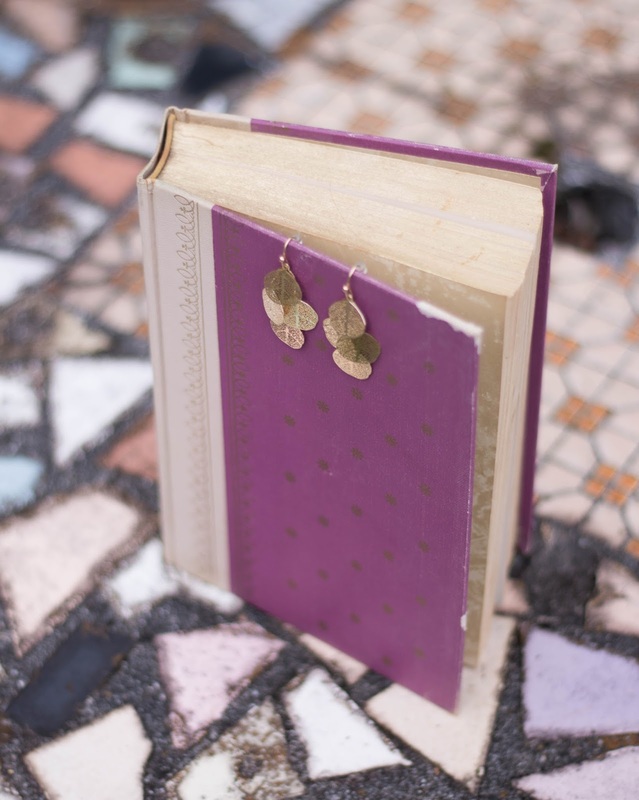 Resembling much of Anthropologie's style, I've found their drop leaf earrings to be unique and pretty, at a bargain price point of only $4.99. 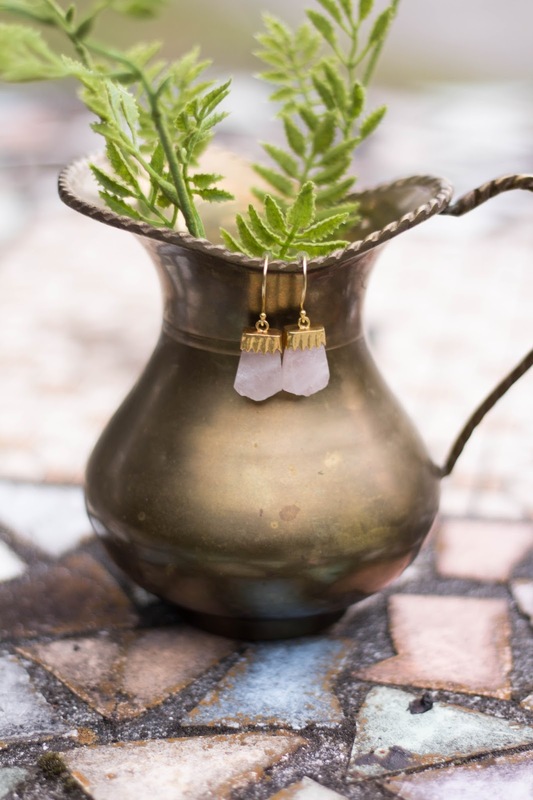 In fact, I seem to buy a pair of earrings every time I scourer their store for decor goodies, just like the second pair of pink quartz earrings below, available in store. 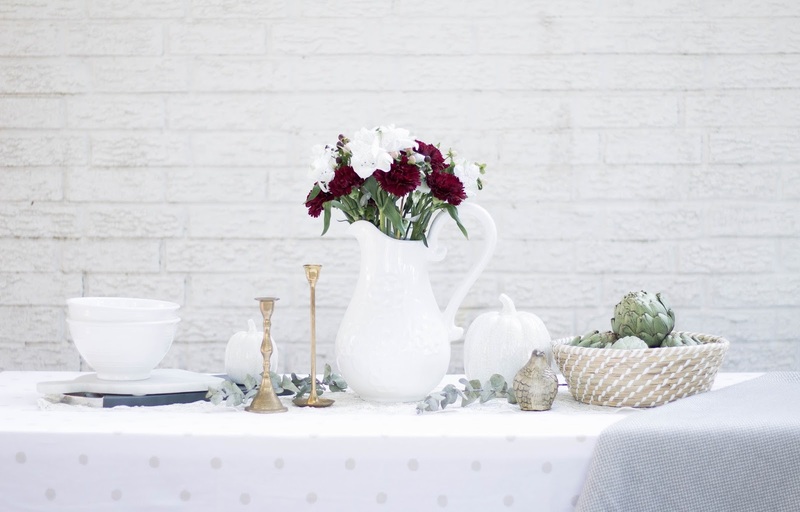 There are a couple of exciting posts coming up this week for Fall entertaining, so please stay tuned for more to come. Until next time, have a lovely week friends! We're in the heart of Autumn and I want nothing more than to head out the door in turtlenecks and darling tights. 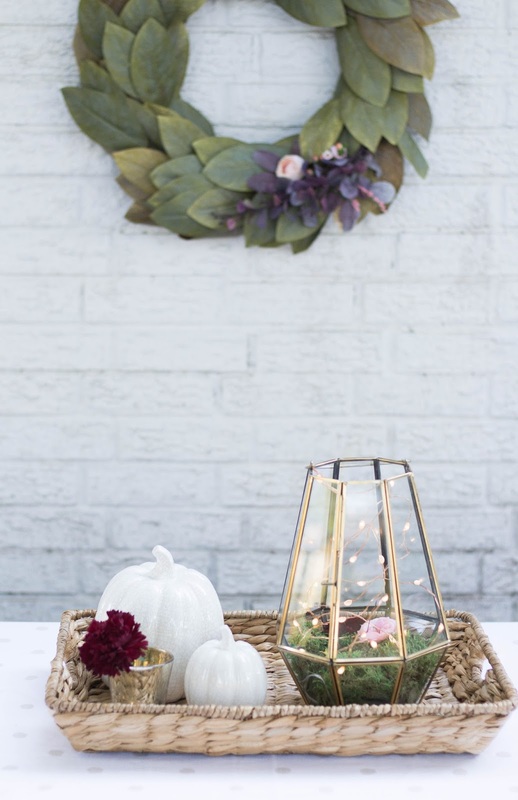 Today's weather has me hopeful that day will come sooner than later, and in the meantime, I'm getting festive with Autumn decorating in the house! It was important for me to incorporate color, texture, and patterns, to create a feeling of warmth and coziness for the Fall season. Pops of navy and black have been my favorite colors this year, surrounding a color palette of neutrals and wood tones. Leather has also made a big impression on me this Fall because I love the rustic qualities in the furniture and accessories. 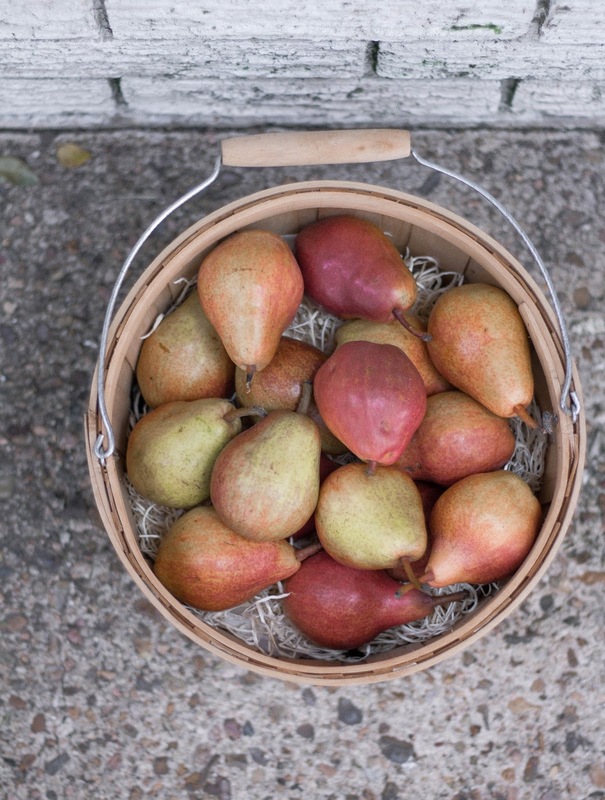 Rather than choosing pumpkins as the main decor prop, I've been using beautiful pears and wheat bunches to adorn my home. And let's not forget the main show piece, plaid prints! 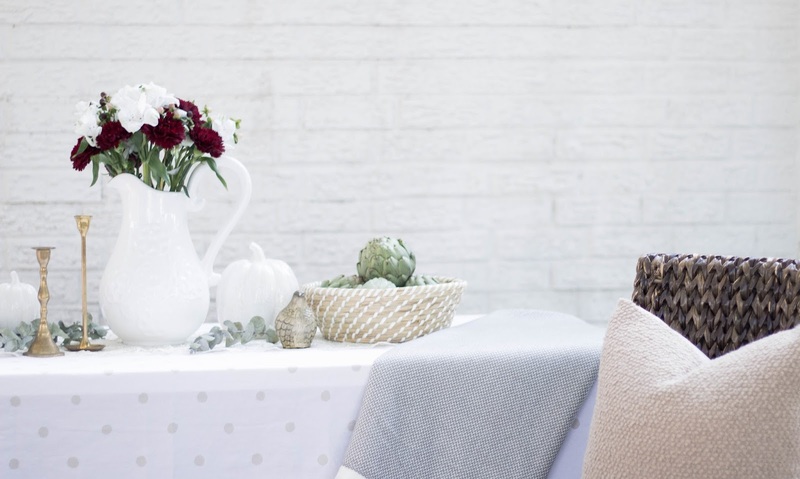 Autumn decorating could't be anymore inviting! 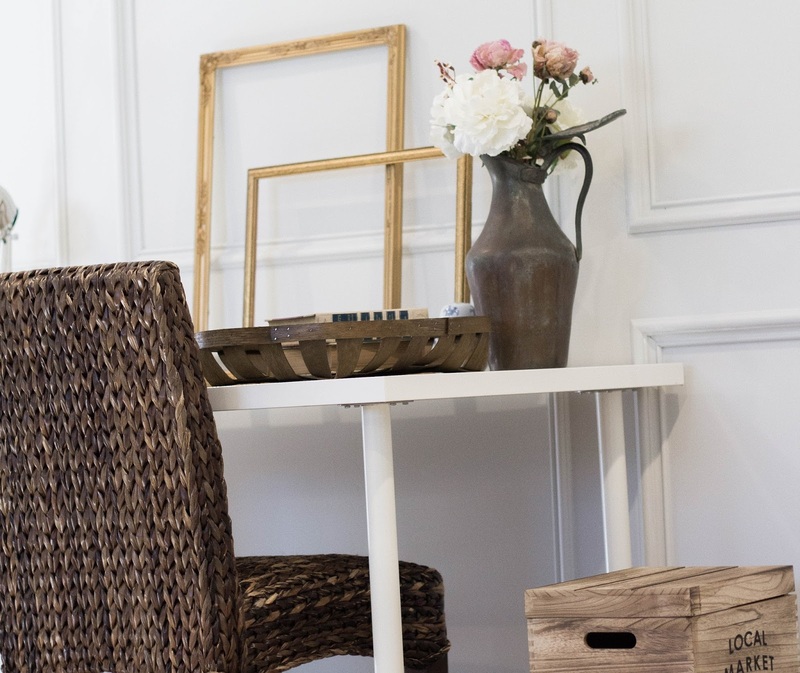 Wood tones add rusticity, warmth, and a natural element to any space. Try using a combination of lighter and darker wood tones to give that cabin like feel in the home. After growing up in Northern California, it reminds me of the times we would camp & hike in Lake Tahoe during November. I can already smell the pine trees now! 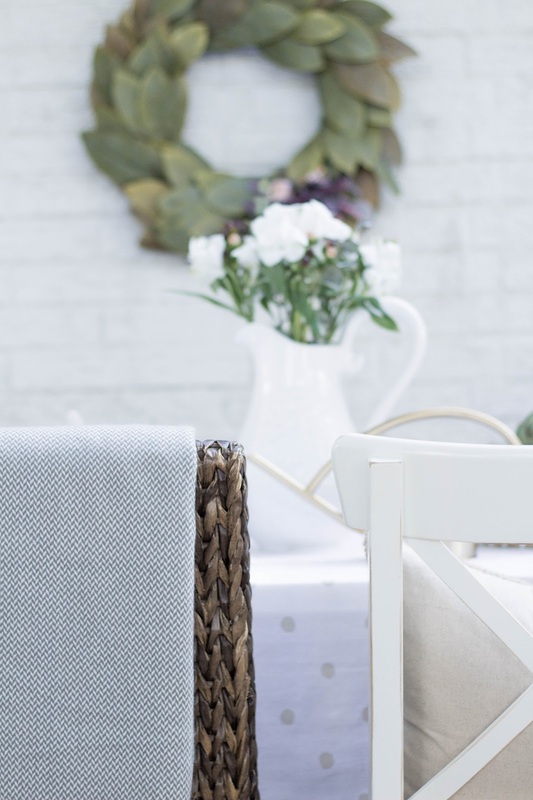 Add texture and interest through classic patterns. Plaid and buffalo check print are huge this Autumn! 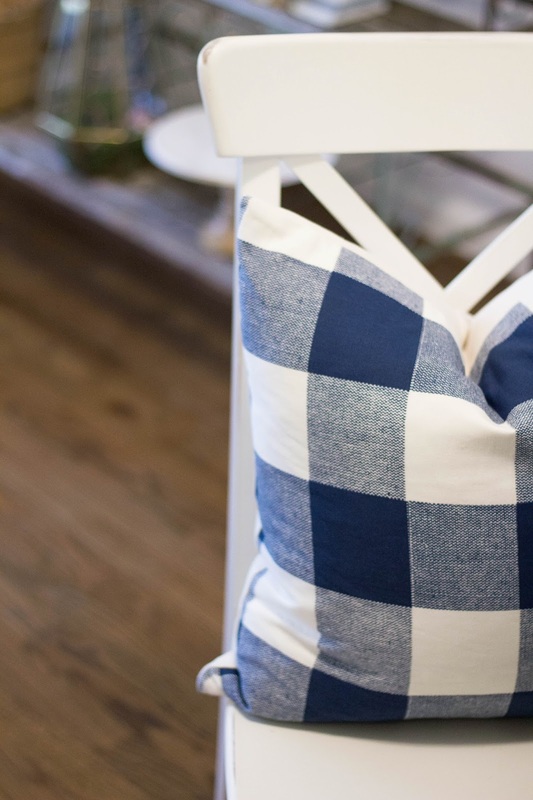 I love seeing this cozy print in pillows and even in this stunning chair by Schoolhouse Electric & Supply Co. Lived in Leather also adds a cozy and masculine quality, which works so beautifully in the small details and with larger furniture pieces. 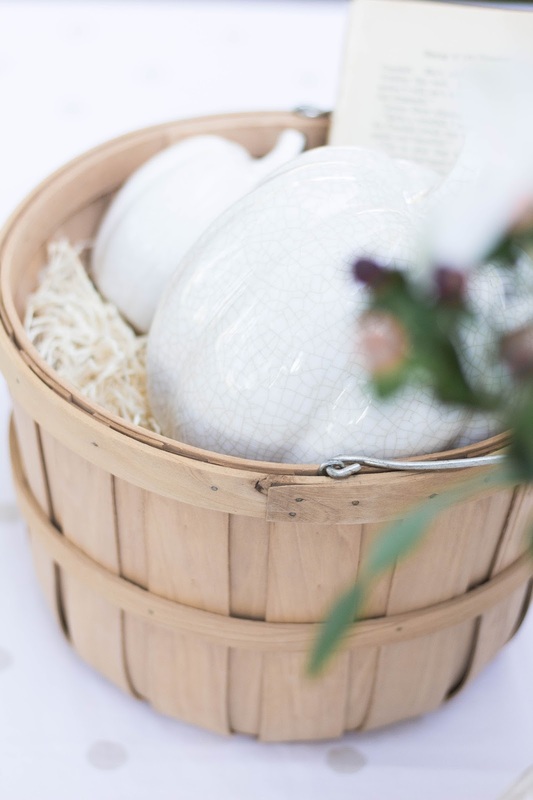 Although I love adding a decorative pumpkin here and there, I think adding fresh produce to a harvest basket or wood tray is a brilliant way to add interest and liveliness to your Autumn home. I was drawn to the gorgeous fall colors in the Pears I found at my local grocery store and thought they were a festive way to complete this look. Of course, I couldn't include an Autumn post without pumpkin decor. 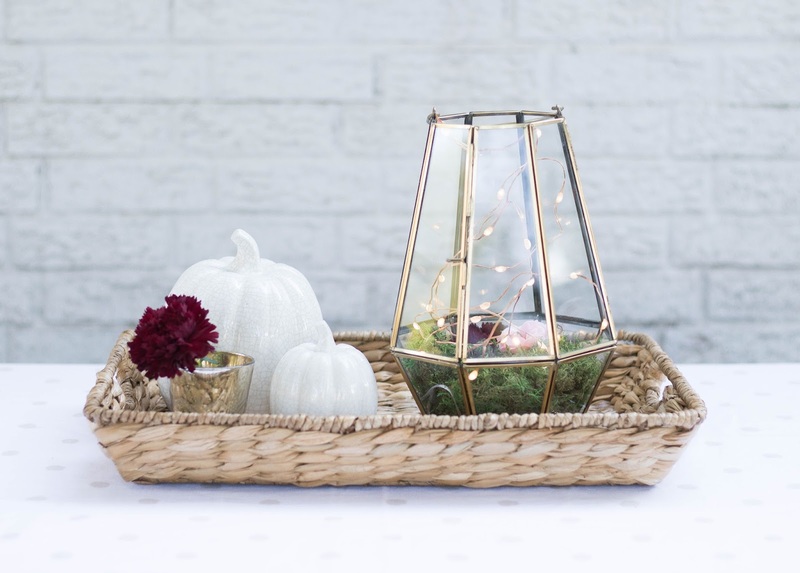 So, here are some pumpkin pretties that would be cute to add on the dining table. 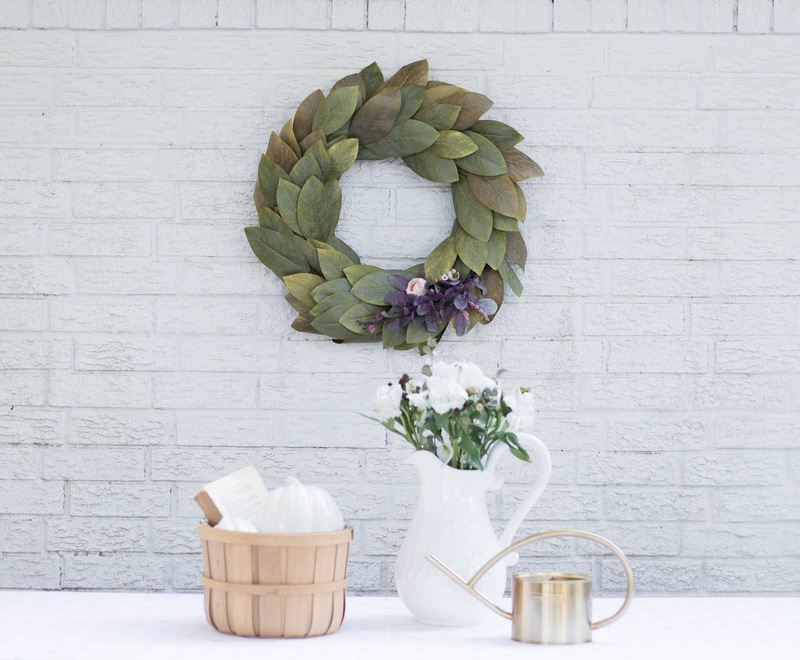 Be sure to also check out places like Home Goods and Hobby Lobby, which have tons of fantastic decor options. 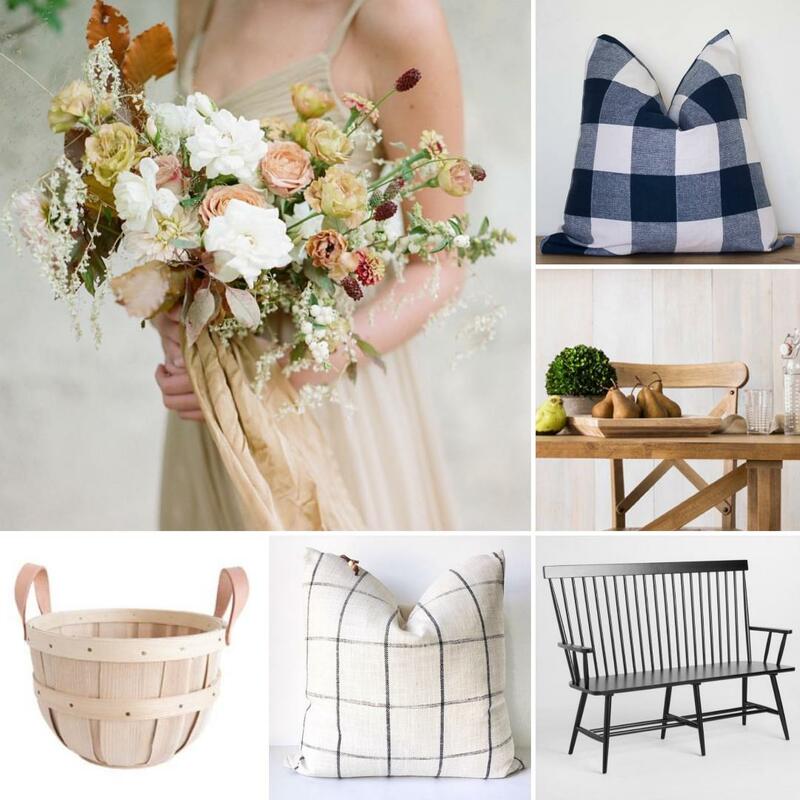 That about rounds up my Autumn picks for 2017 and I hope this inspires you to transform your home into an inviting and cozy space. 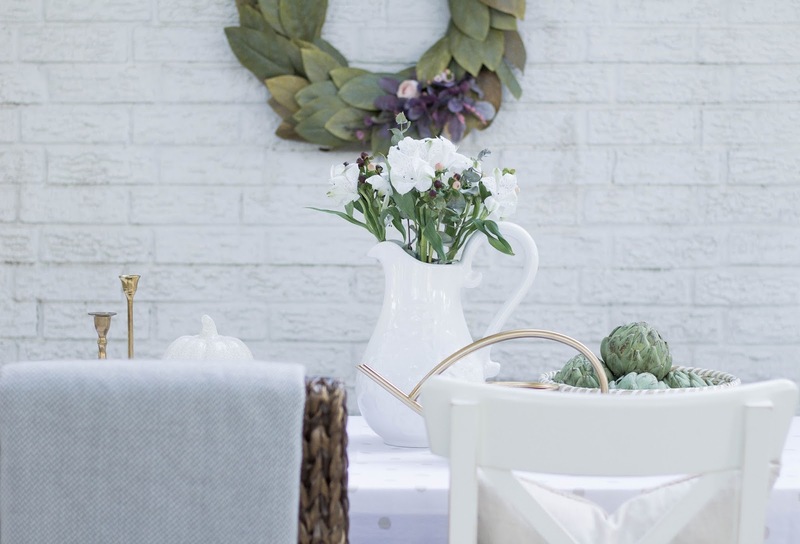 Decorating for Fall can be beautiful and inviting, with a few festive elements and your everyday decor items. 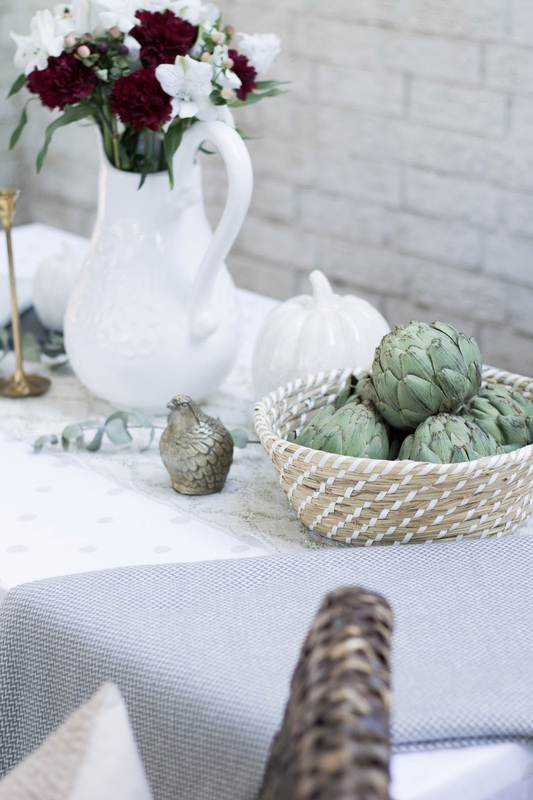 Whether you're styling a table, kitchen island or outdoor celebration, I'm sharing 3 ways to create a lovely Autumn centerpiece. 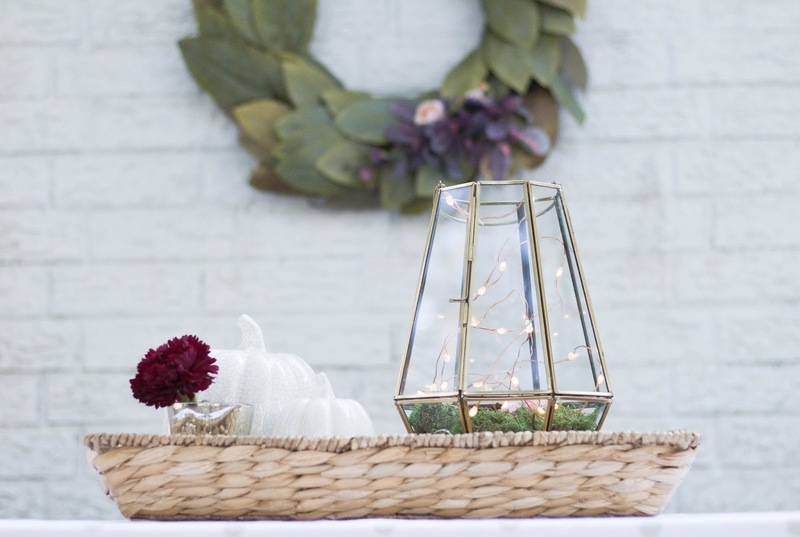 To create this polished farmhouse look, I used a triangle layout of varying heights for a cohesive and beautiful centerpiece. 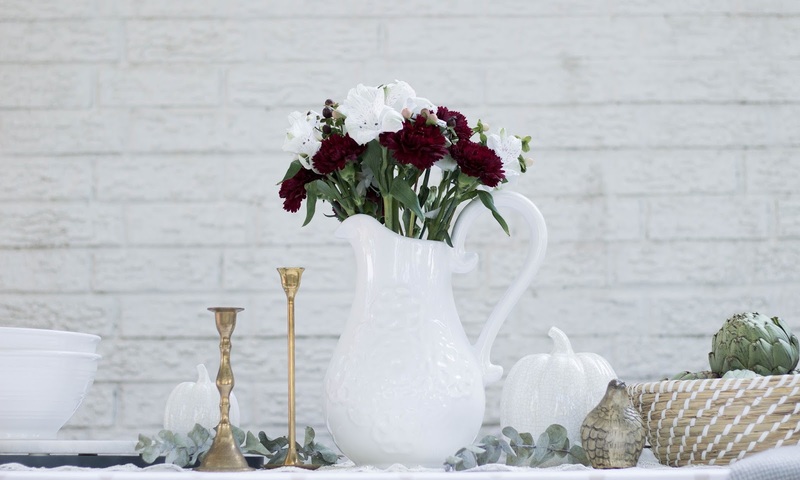 Start by selecting a focal point, such as a pitcher full of Fall blooms and add 2 additional objects or groupings of different heights to complete the look. 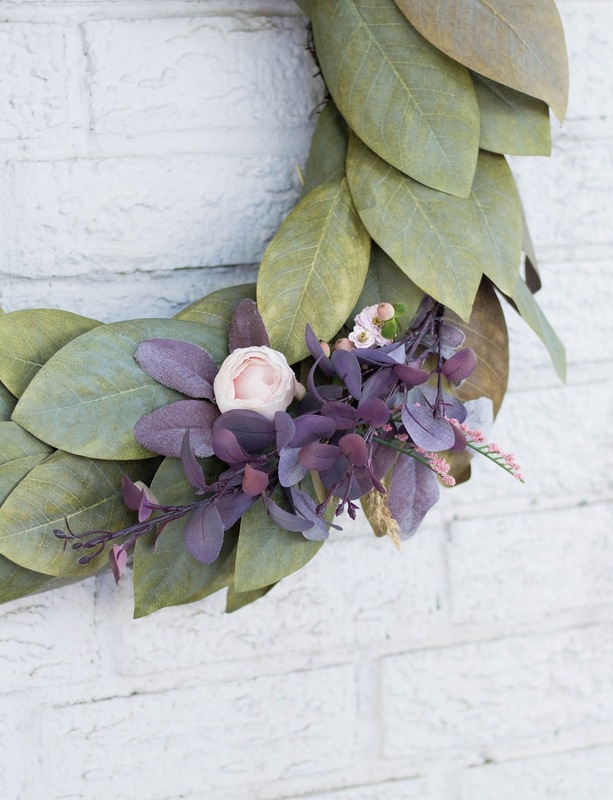 I love incorporating natural elements wherever I can. 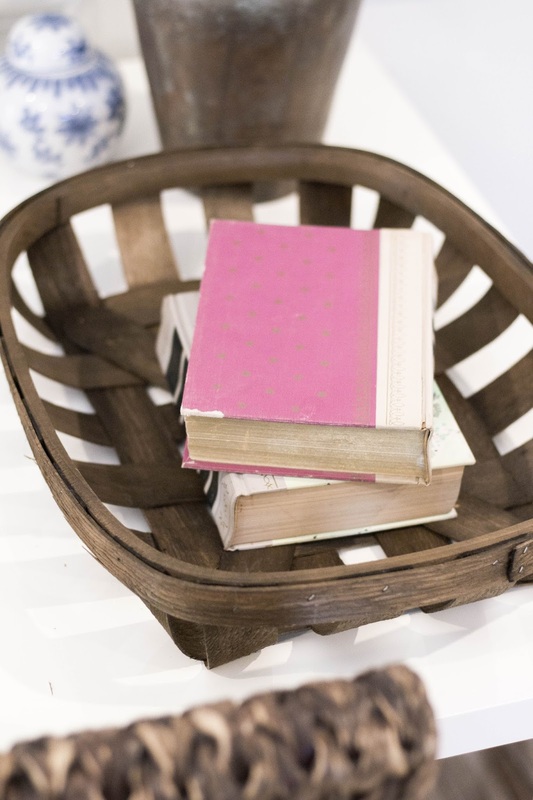 So, this wooden harvest basket with soft white pumpkins and a vintage book was the perfect addition to this vignette. 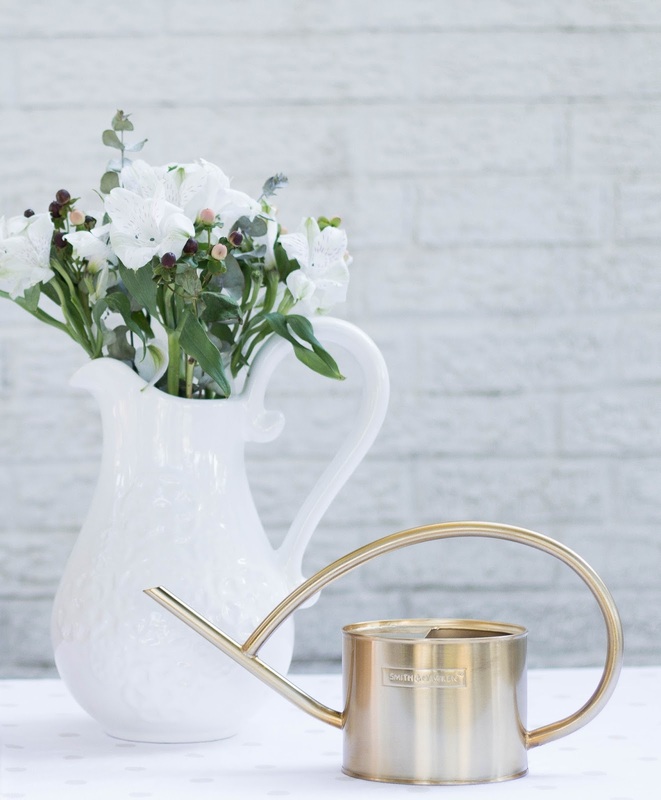 And let's not forget this adorable copper watering can from Target, that's simply irresistible. 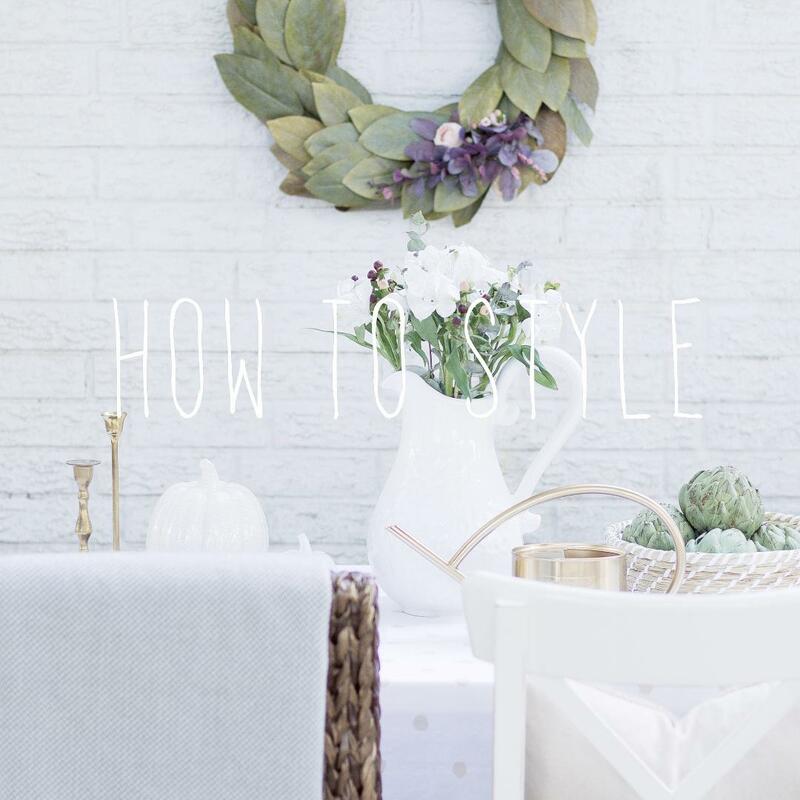 Style Tip: It's always visually appealing to style in odd numbers and at a different heights to create a look that's well put together. 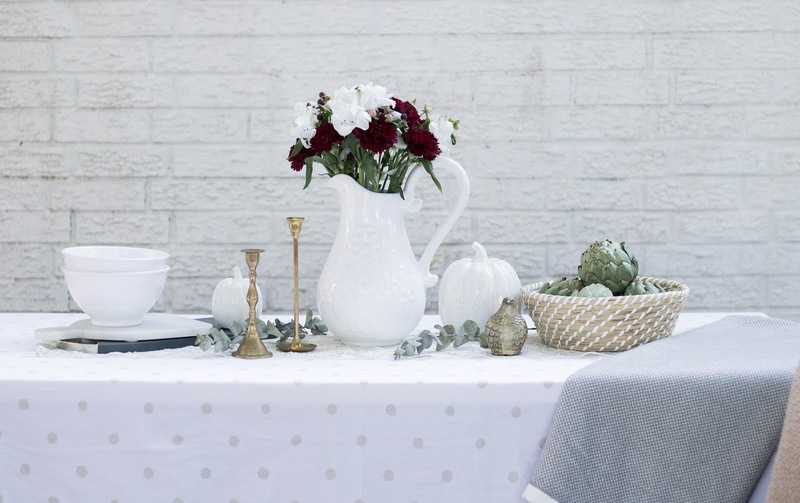 For decorating commonly used spaces, like a dining table or kitchen island, filling a tray of decorative objects (rectangular or round) is a brilliant way to create an effortless festive display. At meal times, simply remove the tray until you're ready to put it right back in its place. 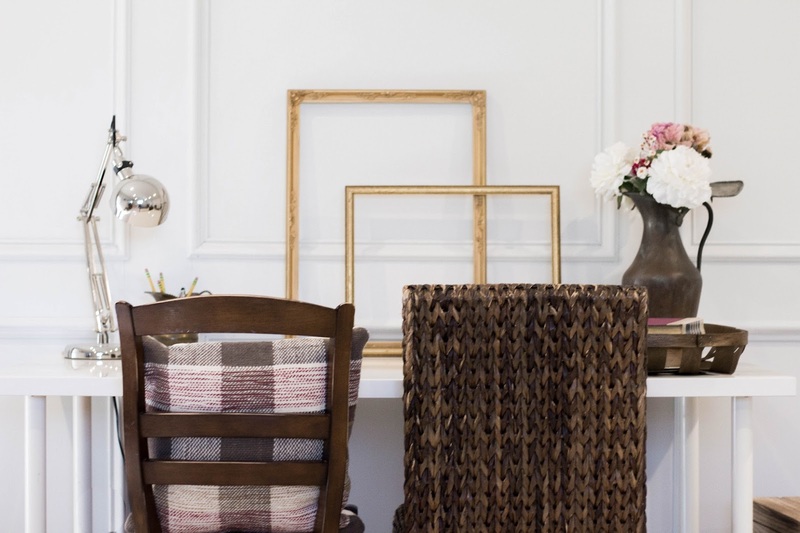 Begin with a large handwoven seagrass tray and fill the space in two parts. 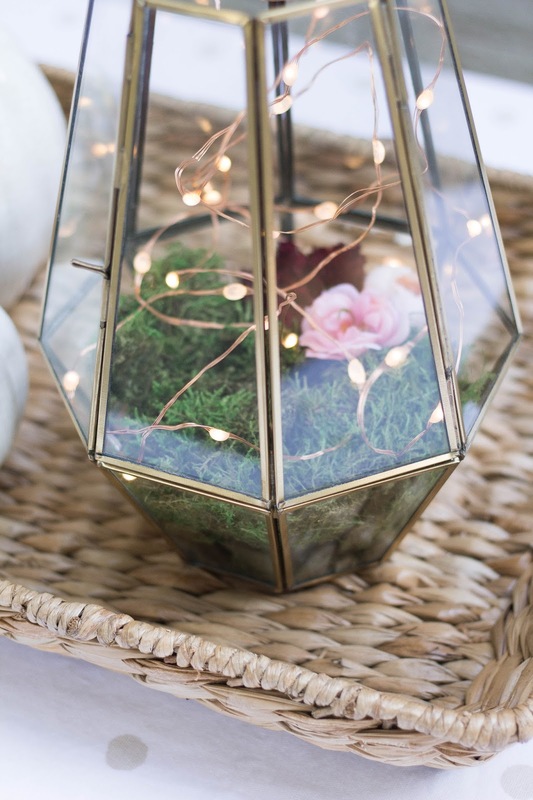 To one side, add a floral arrangement or garden inspired focal point, like this beautiful lit terrarium lantern, and balance the other side with a few festive objects. 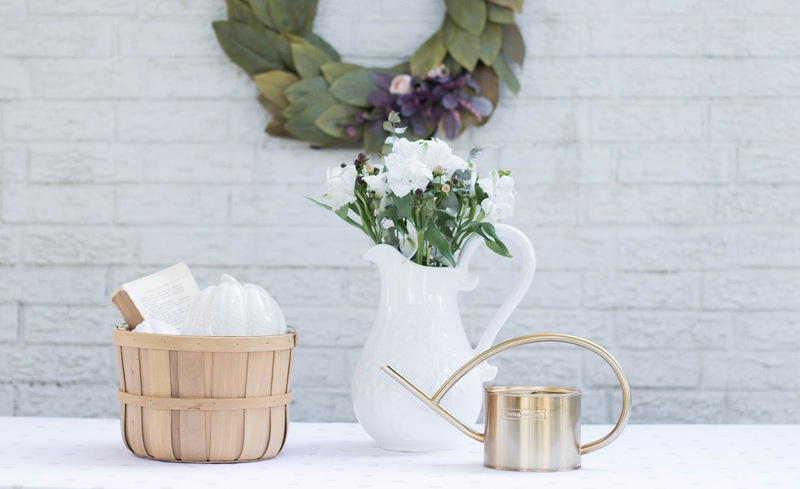 Style Tip: Adding natural elements helps to create a look that's warm and inviting. 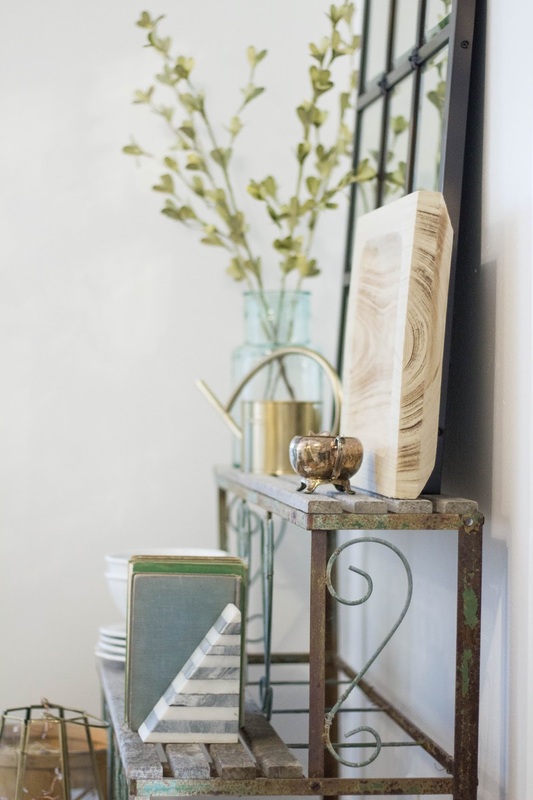 This is why I like to make it a rule of thumb to include at least one natural object in every space I style. 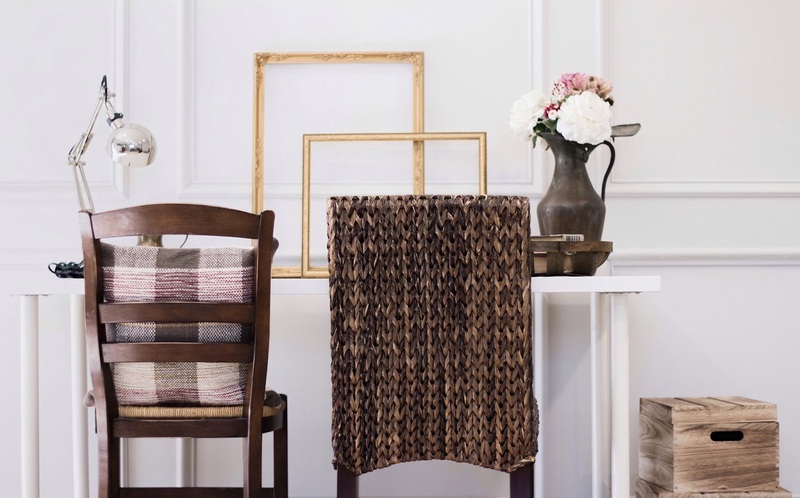 For Fall gatherings and formal dining spaces, why not create a dancing ensemble of texture and layers! 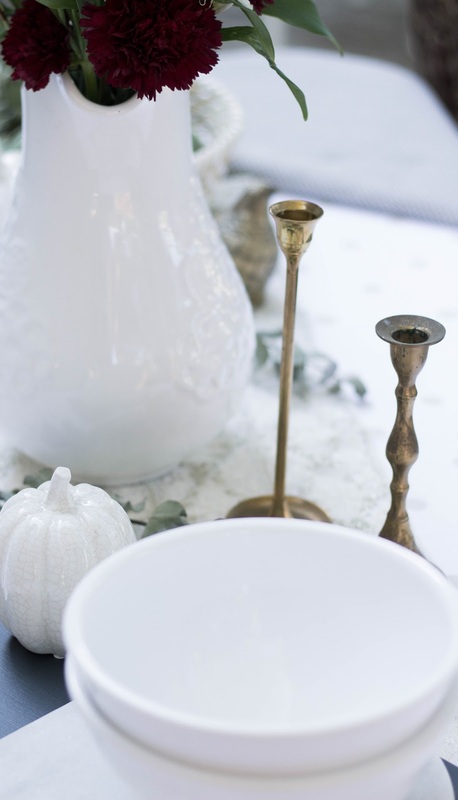 Center your focal point and use a combination of Fall objects, tableware, and brass candlesticks to set the stage. 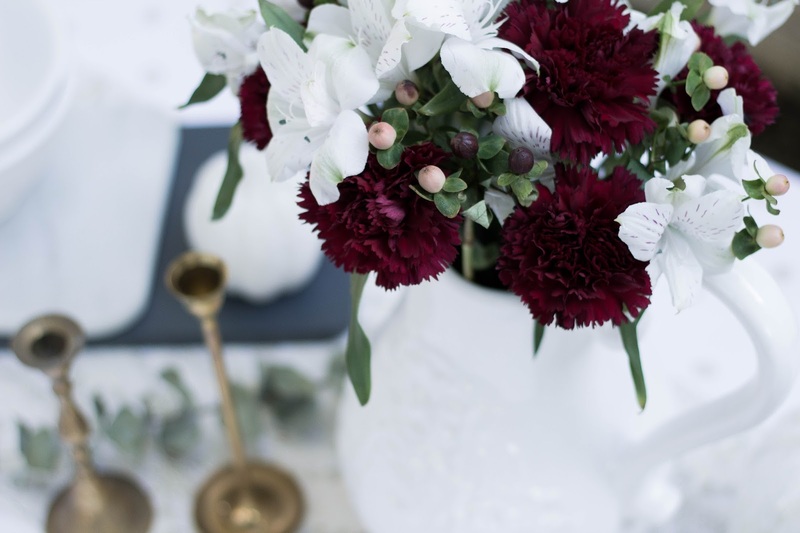 Add warmth and coziness through pops of color and texture, as I did with the navy painted cheeseboard and moody burgundy blooms in the centerpiece. 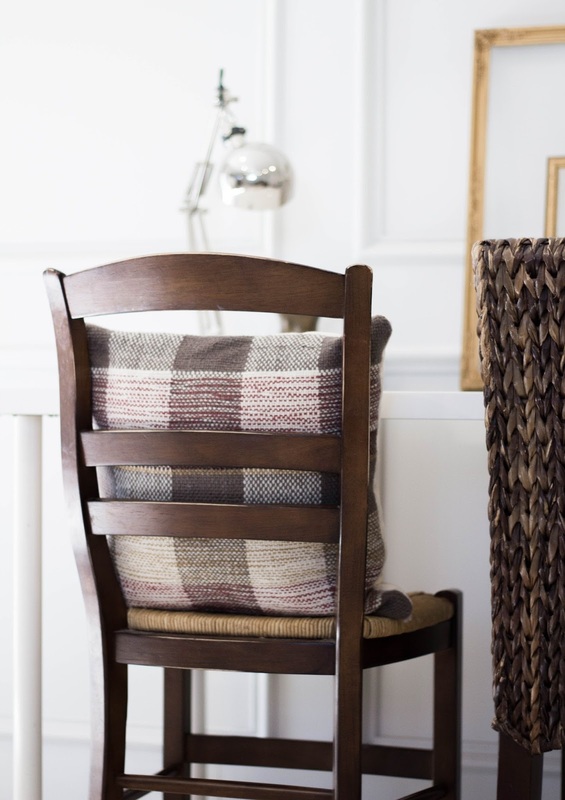 Add a herringbone throw and a textured pillow to an eclectic mix of chairs to complete this enchanting Fall story. 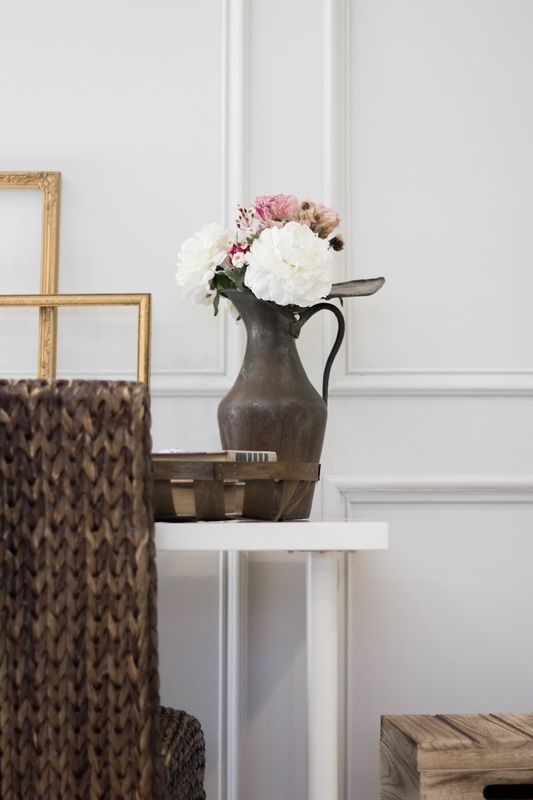 Style Tip: Bring life to your display by infusing texture throughout. 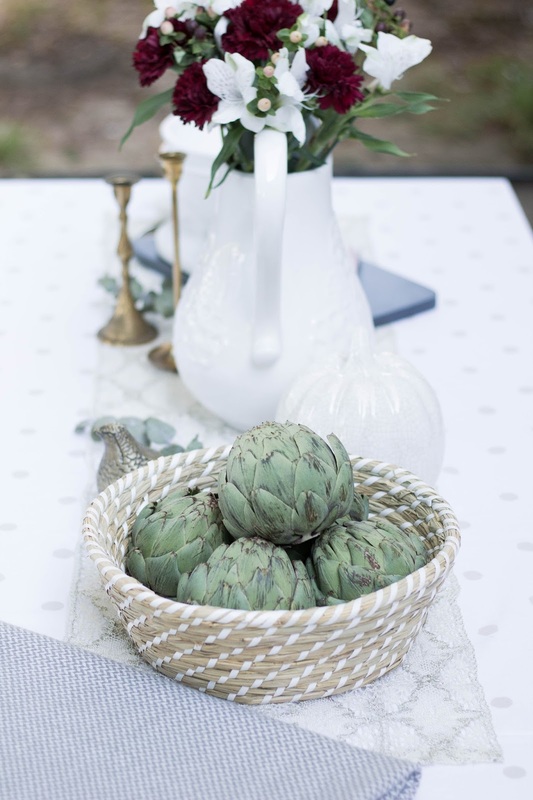 I designed a dance of texture through the additional lace runner and textural objects (basket, bird figurine, and basket of artichokes), to keep the eye's intrigued. 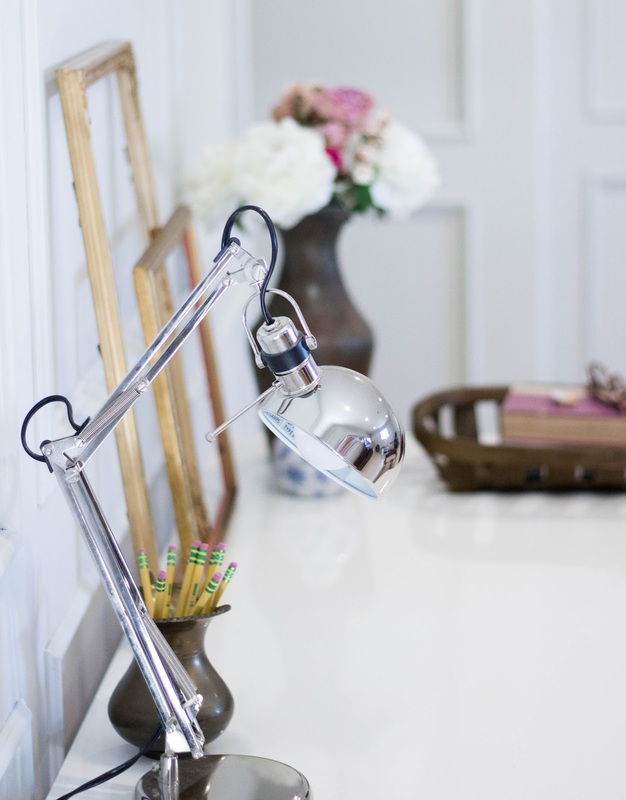 Be creative and experiment with different layouts to see what works well with your space. 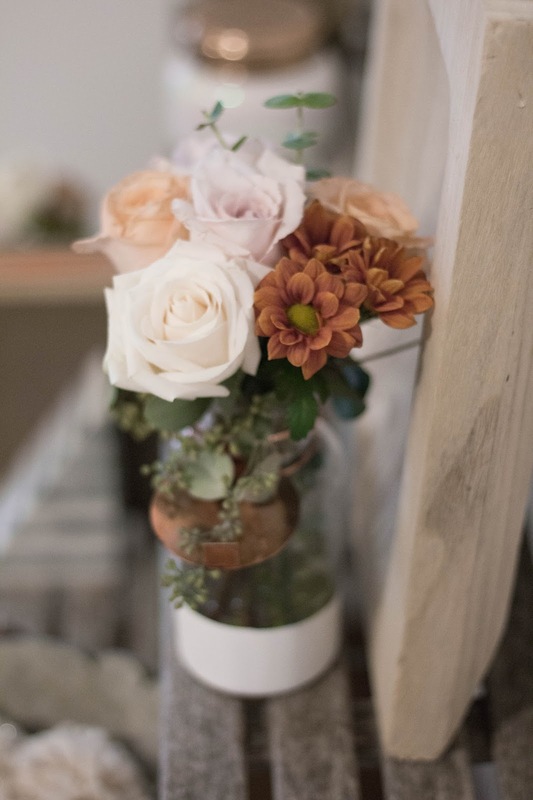 Start with a color palette or 3-4 colors and gather all the decor (existing and new) that fall within your color palette. 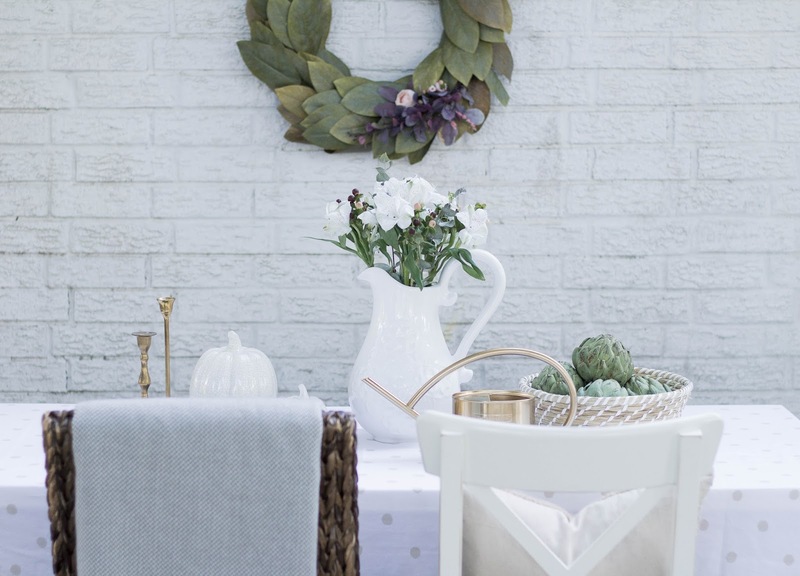 Add texture and varying heights to keep the look intriguing and don't be afraid to think outside the box. 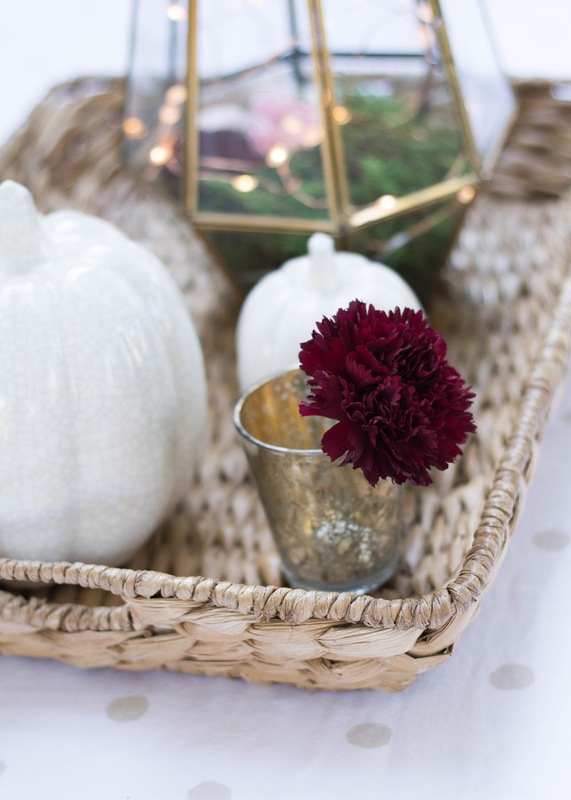 As much as I love pumpkins, leaves and acorns, it's completely fine to use just a few seasonal elements to create a look that's equally as festive and beautiful. 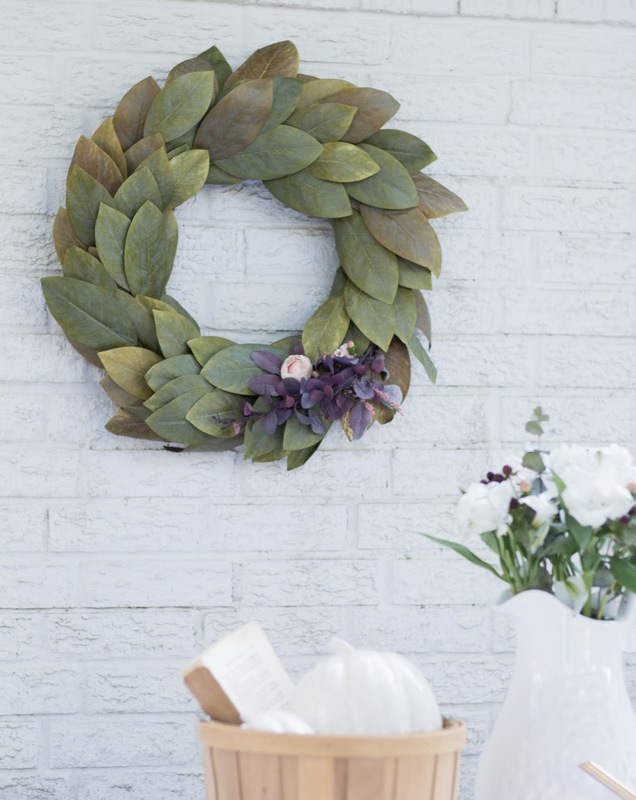 What are your favorite things to decorate with during the Fall season? Have a wonderful week ahead and Happy Fall!